The first rule of any battleground -- military, political, or cricket -- is: Do not fight to your rival's strengths. Entice him to fight you on yours. You wonder what madness seized Rahul that he has decided to play to the BJP's strengths, says Shekhar Gupta. You never know how 'young' people think these days. So we cannot be sure if a threadbare debate on his religiosity is what Rahul Gandhi desired coinciding with his elevation as party president, or if it is something that his party slipped up on. Either way, the next chapter in his politics is now scripted. This script is written to last. It won't end dramatically even if he bared his torso with the sacred thread, posted pictures on social media showing how he rolls it around his ear in the proper ritual gesture while going for his ablutions, or the evidence of his janeu-ceremony. Nor will it end by his party proving the Bharatiya Janata Party's dirty tricks -- people flicking the visitors' register at the Somnath Temple. The reason the story will not have a quick, dramatic end or an uneventful fizzle is simple: Rahul's faith or his religiosity was never an issue in national politics. It may have been the case to some extent with his mother. But Rahul? Nobody cared which God he prayed to, or if he prayed at all. Secularism has no fixed, doctrinaire definition. It can vary from Nehru's agnosticism to Atal Bihari Vajpayee's soft, personalised, inclusive catholicism (this expression used in a non-religious sense) to Narendra Modi's minimalistic acceptance of the Constitutional obligations of secularism and his constant manoeuvring to reconcile it with unapologetic Hindutva. The reason we do not list the hard Left here is if you are a pucca atheist, secularism is really not for you. We are keeping this debate only among the believers, who, all polls so far (including Pew repeatedly) tell us, are 98 to 99 per cent of Indians. Here is how religion has featured in our national political argument so far: Can/do you use religion in your politics or not? Do you treat adherents of all religions as equal? Do you seek votes in the name of religion? The big questions never have been: Do you believe in God? If so, which one? How often do you go to pray? Do you know/follow your ritual? If so, can you show me evidence? This country's voters have repeatedly elected an agnostic (Nehru), iconoclasts of the Dravida parties, atheists of the Left, and similarly saffron-clad sadhus and mahants, and members of the Sikh and Muslim clergy. Religion does become key in specific situations and regions, as in Punjab with the Akali Dal, and in Kerala with the Muslim League and Kerala Congress. But whoever bothered with Rahul's religion or religiosity unless he's been reading trolls on his new toy, Twitter, and responding? Between the Congress and the BJP, that equation is clear enough. One's proposition is liberal, aggressively secular, with the ability to wear its nationalism and, more so, religiosity lightly on its sleeve. The other's is hard Hindutva, encompassing the Constitutional compulsion of secularism, hard nationalism, and unapologetic, overt religiosity. You'd wonder what madness seized Rahul that he has decided to play to the BJP's strengths. Kamikaze (suicide attacks by Japanese military aviators against Allied naval vessels during World War II) is a stirring version of valour. People write hair-raising stories about it and generations marvel at your courage. But only after the war is lost and you are long gone. Rahul's visits could be seen as a realistic acceptance of a new, post-2014 India, where religion has been successfully melded with a new nationalism. Minorities have been excluded from establishment structures on this premise: If you won't ever vote for us, why come to us for a share in power? A majority of the Hindu voters has accepted this. So what choice are you left but to make a main-bhi-Hindu (I too am a Hindu) statement? Whispers go on -- especially now on social media -- about your faith, given your eclectic ancestry, so put it all to rest. 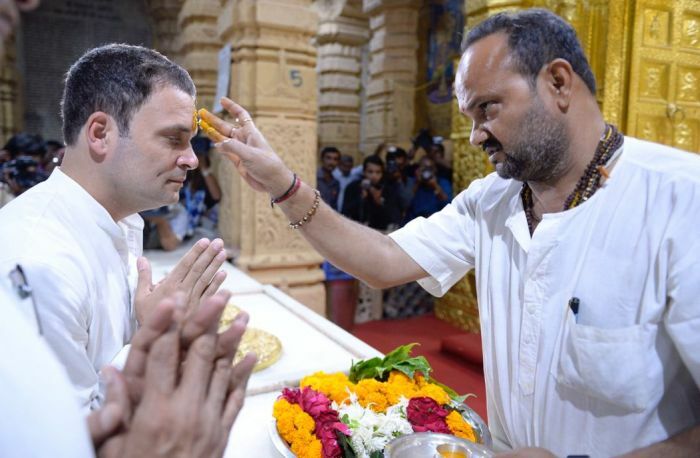 The issue has now gone beyond temple visits or even Rahul signing a register at the Somnath Temple. No problem that the visit was politically loaded: A Nehru-Gandhi visiting the Somnath Temple during a Gujarat campaign in the times of Modi. His event managers should have anticipated the visitor book issue, which is still a minor, tactical mess. The debate would have gone in a different direction if Rahul had responded with something like: As a believer, I pray at all places of worship. I believe your own faith should be personal to you, as Hinduism is for me and I do not flaunt it as most others don't. It's a losers' cheap trick to try making my religiosity an issue in a state election in which you are a 22-year incumbent with this and that wrong with jobs, growth, corruption, and blah blah. We had, on the other hand, Randeep Singh Surjewala outraging over the questioning of Rahul's faith and then producing the nugget that not only is he a Hindu but a janeu-dhari one. Now, does wearing the sacred thread make one a better, more proper Hindu? Do our Gods shower greater benevolence over those who follow all Brahmanical or Vedic rituals and wear symbols of religiosity? If this is a qualification for Hinduism, then tens of crores in our country will be reduced to being apostates. It is poppycock. Hinduism doesn't insist on any symbols, unlike Sikhism with its essential five or Islam and others with genital surgeries. This is no value judgment, just a statement of fact. Until Indira Gandhi's last innings, after her 1977 defeat, the dynasty had kept its religiosity out of public view. It may have been the trauma of defeat, but more likely the loss of Sanjay Gandhi that made her change. The rudraksha became more visible, babas and tantriks appeared. Some of it was driven by personal paranoia. As some tantriks caught hold of her insecurities, at one point she even started worrying that enemies will send destructive vibes to her through pigeons and other birds. Her security was ordered to seal all her windows, especially ventilators, to make her home bird-proof. But she never flaunted her new religiosity nor was she asked any questions. The shift came under Rajiv Gandhi. It was rooted in his first blunder, yielding to the maulvis to set aside the Supreme Court judgment in the Shah Bano case. It shocked middle-of-the-road Hindus, gave the BJP (then down to two seats in the Lok Sabha) a new wind and suddenly the argument of appeasement of Muslims in the name of secular, vote-bank politics had wide currency. It was in reaction to this that Rajiv committed a series of blunders. He allowed the unlocking of the Babri Masjid-Ram Janmabhoomi site, pretty much endorsed the temple's foundation stone laying (shilanyas), and then launched his 1989 campaign from there -- with a promise of ushering in Ram Rajya. We know how that election ended. The Congress was reduced to less than half of its 414 seats, lost its heartland Muslim vote, and gave the BJP the space it needed: To use Hindutva to re-stitch what caste divided. The Congress never recovered from it. Rajiv was beleaguered by many crises at that time. Shah Bano was his original sin that lost him his secular-liberal pulpit. He over-corrected in panic and lost the Muslims (who saw the threat in Ayodhya), and gifted middle-of-the-road Hindus to the BJP. He had blundered into fighting the war to the BJP's terms and strengths. If Rahul wants to repeat that history, janeu and all, he is free to do so. He's an adult, and the boss of his party.